VelaLabs has expanded its physico-chemical portfolio via the implementation of a range of diverse structure determination methods. VelaLabs offers also liquid chromatography mass spectrometry (LC-MS), gas chromatography mass spectrometry (GC-MS), size exclusion chromatography multi-angle laser light scattering (SEC-MALLS) and capillary electrophoresis (CE). Subsequent to the acquisition of our new equipment and integration of this innovative technology, we are now offering modern, up-to-date analytical methods for determining structural characteristics of peptides, proteins and small molecules. 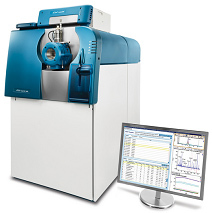 Mass spectrometry (MS) is a rapidly-emerging technique to characterize protein drug therapeutics. Such proven analytical methods are now routinely used to characterize biosimilars, biopharmaceuticals & biological products during pre-clinical and clinical development as well as analysis of products during process development. The new portfolio at VelaLabs that encompasses protein mass spectrometry consists of three consecutive stages of implementation – each dedicated to support our clients in all phases of product development and before batch release. (Pre-) clinical Studies: Here, LC-MS will provide an analytical portfolio that enables protein-based drugs measurements in complex matrices (e.g., human serum/plasma samples). As a proof-of-principle, a simulated pharmacokinetic (PK) study on pegylated and non-pegylated granulocyte colony stimulating factor (pegG-CSF and G-CSF) and on a second biopharmaceutical, rituximab, is currently evaluated. Market Authorisation: Protein mass spectrometry will be used to perform: (i) stability studies, e.g., determining the degree of protein oxidation and de-amidation of a biopharmaceutical product; and (ii) comparability studies between batches via peptide mapping and glycoform analysis. Batch Release: Via peptide mapping, LC-MS will be used to: (i) assess protein product batch-to-batch consistency; (ii) monitor/confirm recombinant amino acid sequences; and (iii) determine the degree of impurities, e.g., via host cell protein analysis. Similarly, intact protein analysis will confirm: (i) complete protein expression; and (ii) the major glycoforms and glycosylation pattern of the Protein. VelaLabs also offers characterization of Extractables and Leachables (E&L) components from the primary packaging materials of (bio-) pharmaceuticals and biosimilars. Extractables are investigated during material characterisation and during selection of different primary packaging materials. Leachable studies are required for market authorisation as compounds that have leached from the primary packaging material into the drug product must be investigated. Via the combination of gas chromatography mass spectrometry (GC-MS) and high resolution liquid chromatography quadrupole time-of-flight (Q-TOF), and liquid chromatography mass spectrometry (LC-MS) we are implementing an orthogonal approach to ensure maximal coverage of volatile and non-volatile compounds. Unknown substances can be quantitated using an internal standard response method. For components where the levels exceed safety-relevant thresholds, additional structural information can be investigated to predict a possible structure. For specific analytes, absolute quantitation methods can be established and validated. Extractable and leachable studies of primary packaging material for final drug products will enable our clients to select the optimal packaging material(s) and demonstrate safety for complete shelf life.